New Delhi, Feb 2, 2018: Shri. Bibek Debroy, Chairman of the Economic Advisory Council of the Prime Minister, presented One Globe Awards 2019, at the eighth edition of the two-day event (One Globe Forum) in the capital. The One Globe Awards recognizes and honors organizations and individuals for their contribution in building a 21st century knowledge economy. 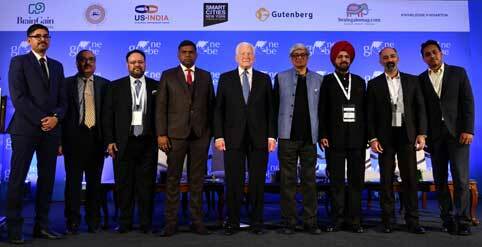 The One Globe forum was inaugurated by Shri. Satya Pal Singh, Minister of State for Human Resource Development, Speaking at the inauguration of the forum Shri. Satya Pal Singh congratulated One Globe Forum which he believes can play a role in uniting humanity and not just building a knowledge economy. He added, the challenge we face is that the Indian ecosystem is devoid of basic human values. A child should go through a holistic development program which is currently lacking in the education system in India. Dr. Shashi Tharoor, Member of Parliament, Lok Sabha took over the stage as a key note speaker discussing, “The challenge is to allow the society to understand the value of strong foundation. In India, we have a system in our higher education that is over regulated and under governed. As a result, we don’t focus on our outcomes, instead we heavily emphasize on processes that result in lack of flexibility. In many scientific and technical institutions, we tend to teach what is already outdated 7 years ago and this is clearly what is wrong with the 21st century. In working towards the 21st century knowledge economy, do not teach children what to think; teach them how to think, that’s all that matters”. While congratulating the winners, Harjiv Singh, Founder & CEO, BrainGain Global said, “It is very encouraging to witness a series of efforts being made towards building a 21st century knowledge economy in India. We are very thankful to each one who has won and carved a niche in the century we are in. Right from driving excellence in the digital landscape to creating social impact, everyone has made a significant contribution to build this conversation. In the past seven years, we have witnessed immense transformation and impact on the entire ecosystem”. Leaders such as Shri. Manish Tewari, Former Minister of State, Minister of Information and Broadcasting, Bibek Debroy, Chairman of the Economic Advisory Council to the Prime Minister, Smt. Preeti Sudan, Secretary, Department of Health and Family Welfare; Sutapa Sanyal, Member, Advisory Committee Central Adoption Resource Authority; Jerry MacArthur Hultin, Chairman, The Global Futures Group, LLC, President Emeritus, Polytechnic Institute of NYU, Chairman, Smart City Expo World Congress Advisory Board;former Under Secretary of the Navy (United States); Mr. Satjiv Chahil, Silicon Valley Marketing Guru; Mr. Vinay Kumar, Director- AI, Microsoft and Lord Raj Loomba CBE Founder & Chairman -Trustee, The Loomba Foundation among others were the speaker at the forum. Some of the leading personalities that participated in the forum include – Mr. Mukesh Aghi; CEO of USISPF, Baroness Sandip Verma; Member of the House of Lords UK, Rajeshwari Ramanan; Assistant Dean of Career Management, Georgetown University, PR Ganapathy; Regional Director, Stanford Seed, Ramesh Jagannathan; Managing Director of StartAD, NYU Abu Dhabi, PK Agarwal; Regional Dean and CEO, Northeastern University, Dr. Shailaja Fennell; Lecturer, Centre of Development Studies, University of Cambridge, Chokan Laumulin; PhD Researcher, Centre of Development Studies and Darwin College, University of Cambridge, Mahendra Bapna; Advisor (Industry-Academia Interface), IIT Jodhpur, Fariha Ansari Javed; Board Member, Harvard Business School of India, Ariadne Papagapitos; Co-founder & Director, New Markets, Localized; Managing Director, Makarand H. Chipalkatti; Dr. Chips Consulting LLC; Projjol Banerjea; Founder & CPO, Zeotap; Dr. Priya Virmani; Founder & Director, EmPower Art, Anisha Singh; Founder & Managing Partner, She Capital, Prabhakar Jayakumar; Country Director, India, Digital Ocean, Sousthav Chakrabarty; Co-founder & CEO, Quotient Digital Solutions Pvt Ltd, Jagdish Mitra; Chief Strategy Officer, Tech Mahindra, Ashwarya Singh; CEO, Drivezy, and other top experts from Meridien International Center, Asian Century Communications, Central Adoption Resource Authority (CARA, QuaQua, GD Goenka World School, Anthill Ventures, Guiding Star Digital, OC Pvt Capital, Cygnus Hospitals, ZipLoan, Smarten Spaces and Avanti Finance.